It's just ok. Not the greatest, not the worst. Pros: It does an ok job for us. I don't hate it as much as I hate our DMS. One of our best marketing tools. Pros: The campaigns and reporting are easy and effective. Service Department raves about this product. Pros: Reminders, Toolbox and coupons are just a few of the plus features with this tool. Pros: They make advertising easy. Many ideas and great support. Pros: Great Company and marketing tool. Sales team works hard for us. We use this tool for sales and service. Pros: Marketing plan is easy to manage and results are great. Pros: Huge shout out to Lindsey LaBelle! I found Lindsey extremely knowledgeable, very helpful and thankfully patient. 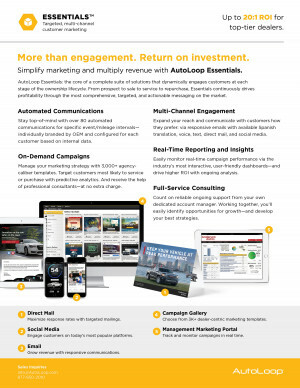 The Autoloop CRM platform is very user friendly product, with real time reports, while building customer retention, value and driving new business to the dealership. Strong! Cons: No cons, keep up the good work! 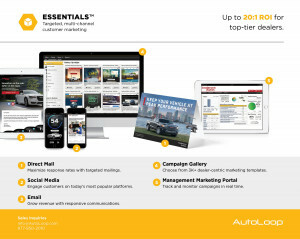 Pros: Essentials will increase your bottom line.